One of the spaces I adore but does not use as much is my desk area. It looks lovely to look at but if I'll be honest, I spent most of the time in the couch or in bed. Also, I do have a projector (in place of a telly) and the white canvass above my desk serves as the screen (making it less likely for me to use the area). However, when I have to do some serious blogging and thinking, this is the place to be. Let's start with the big ones. I bought the white desk (£59.00) and the Eiffel chair (£19.00) from Amazon. Heads up that both of them have to be assembled(!) I am so happy to say that I assembled the chair by myself but the desk is ooh-wee... my powers cannot handle that! Thanks to Gab because he put it together for me. 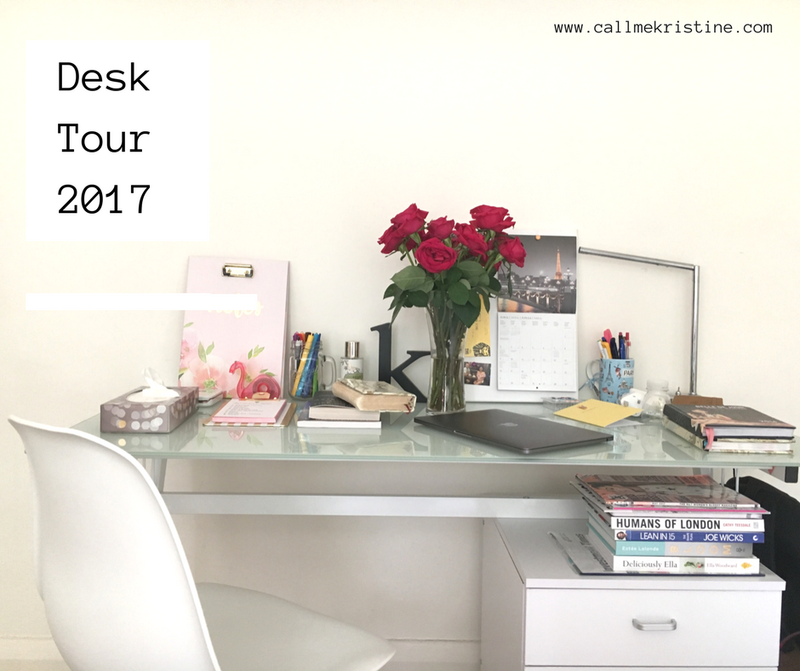 Quick review: The desk is nice and I love it but there was an issue with one drawer handle. The vendor has refunded me for like £20.00 and asked me kindly to just buy the drawer handle. As I was about to buy one, Gab did some of his magic when he visited me one day and I just saw the fixed handle in all its silver glory! Let's get up close and personal. The notes folder is too cute! I got it from TK Maxx for £6.00. It has a big notepad inside but I plan to print some A4 monthly calendar and clip it on top some time soon. The white and rose gold gadget is a photo printer from HP (I posted a detailed review HERE). Swan tape dispenser (£1.00), white canvass board, push pins and letter K are from Tiger. Coloured pens are from Waterstones and the mason jar was a gift. Book was from Amazon.